Following the formation of the Pipe Club of Great Britain in October 1969, the Pipe Club Of London was formed on 23 February 1970. It was the first club under the parent wing of the PCGB. The inaugural meeting of PCOL was held at the Paviours Arms tavern in Page Street, London and 45 persons, of whom 95% had connections with the pipe and tobacco trades, became founder members. The first Chairman was the actor Rupert Davies, who played George Simenon’s Inspector Maigret in the long running BBC TV series and was elected the first Pipeman Of The Year. The annual subscription was fixed at £1.25. A general meeting was held on 26 October 1970, which 42 members attended. 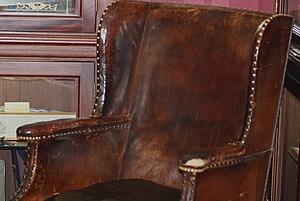 This was the chair used by Sir Winston Churchill while he selected his favourite cigars. Located at James J. Fox – the location for one of our monthly club meetings. A ceremonial poignard, or dagger, made by the Wilkinson Sword Company, was presented to the club as a competition trophy. The club in turn, with the donor’s permission, presented it to PCGB for perpetual use as a club trophy in inter-club smoking competitions. With the eventual demise of PCGB in October 1978, this historic trophy is now held by the famous tobacconists J J Fox and Robert Lewis, 19 St. James’s Street, London in the small museum at the rear of their premises. When you are next in London, be sure to visit this very interesting venue, which has records of Winston Churchill’s cigar orders amongst many fascinating exhibits. At this same meeting, a pipesmoking competition was held against the Cambridge University Smoking Society. PCOL won and was presented the poignard mentioned earlier. At the annual general meeting on 5 April 1971, the presence of one of the Pensioners of the Royal Hospital, Chelsea (the home for retired ex-servicemen in London) was noted. The club offered free membership to all pipesmoking residents of that hospital, and their colourful and distinctive uniforms made a splendid addition to the attendant members. 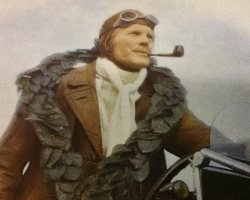 In the summer of 1971 Pipe Line magazine announced a prize of £1000 for Britain’s Champion Pipe Man, in the first ever National Pipesmoking Competition. Contestants were to be decided following a series of regional heats conducted by local pipe clubs. That year PCGB gained its 3000th member with 35 local clubs. confident that the rules could be suitably amended to prevent a recurrence of this situation in future events. This was to be an optimistic view. The First National Pipe Smoking Championship in the UK produced a winning time of 107m 58 secs, smoking a clay pipe. This was a new PCGB record. At a subsequent PCOL function, the flamboyant Member of Parliament Lord Shinwell was the principal guest. 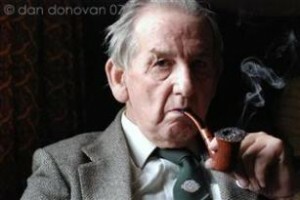 He was presented with a meerschaum pipe, and granted honorary membership of the club. A coach party of 25 PCOL competitors and supporters left Southampton for Le Havre and the long journey by road across France to take part in the World Pipe Smoking Championship in St Claude on 13 October. The competition had nearly 200 competitors and 1000 supporters. a pub with copious amounts of beer available, whilst in London (local time) at 09.30 on a Saturday, the only refreshment was soft drinks and coffee supplied by the hosts. 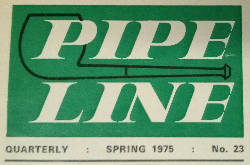 Pipe Line No 36 had the headline “Farewell!” and contained the sad news that PCGB was to close down on December 31 1978. Pipe Line No. 38 contained a history of Geoffrey Sim’s Pipes, together with the news of the launch of F.O.R.E.S.T. (The Freedom Organisation for the Right to Enjoy Smoking Tobacco) by the then Chairman, Sir Christopher Foxley-Norris, GCB,DSO on 18th June 1979. On 5 September, a party of 20 German members attended the club’s meeting at the London Scottish Sergeants’ Mess, to be enthralled by a member giving a talk in German on the production of James Upshall’s handmade pipes. The Londoners had previously had the experience of the same talk (in English!) on an earlier occasion. The manufacturer had brought with him some machinery, with which to display the art and skills of pipemaking and the floor of the Mess was soon covered with chips and shavings of briar. This meeting was one of the Club’s highlights of the previous 2 years. In that year, according to Pipe-Line No 46, there were 2.5 million pipe smokers in the UK and the first advertisement for PCOL appeared in the last known issue of Pipe Line No 57. Over the intervening period a great deal has changed in the world of pipesmoking, but today, celebrating its 40th anniversary, PCOL is still a strong and growing organisation. It is truly international, with over 300 members in 26 countries across the world. Meetings are held twice per month in London and Essex. All pipesmokers are very welcome to attend and activities include competitions, talks and quizzes on tobacco and pipes, visits to famous pipemakers in UK and abroad and most important of all, the camaraderie of fellow pipesmokers in a warm and friendly atmosphere. Most recently an independent film has been made about the club and is due for release in autumn 2010. Fame at last!